We did our first volunteering of the season this week at Gretchen’s Cooking School. The chef was Don Shank of the Rhododendron Cafe, a nice place out on Chuckanut Drive in Bow. The Rhody has a gimmick, of sorts: each month they feature a different theme or ethnicity, so the menu is constantly changing. 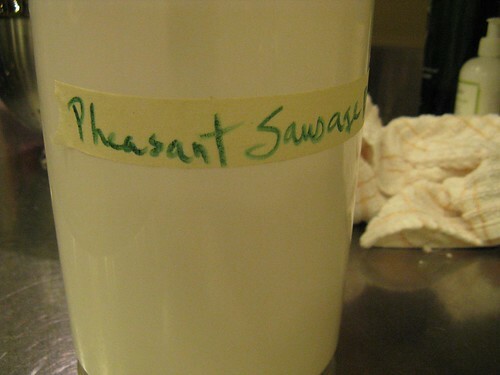 They also close every winter so the owners can travel and keep their sanity – the secret to the restaurant’s longevity. Not a bad idea, really. 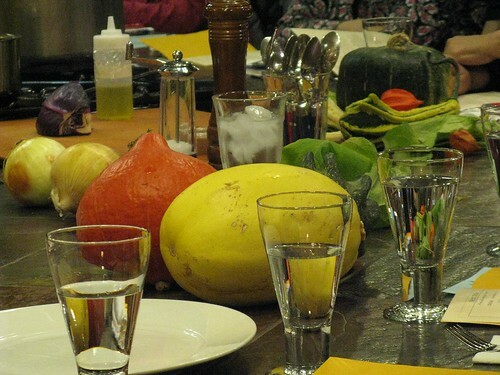 The focus of this class was seasonal food, especially local, so it featured cabbage, squash, apples and cheese. 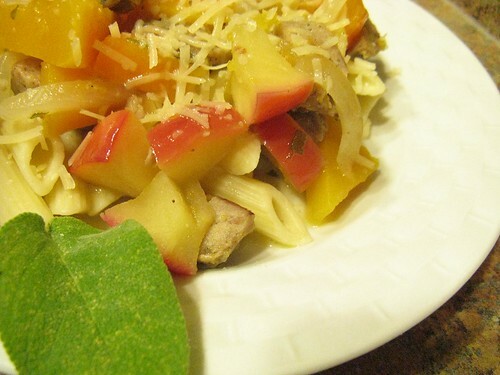 The weather’s gotten really chilly this week, so it was great to have all the warm, sweet flavors. Don brought lots of extra squash and some branches of Chinese lanterns for decor. 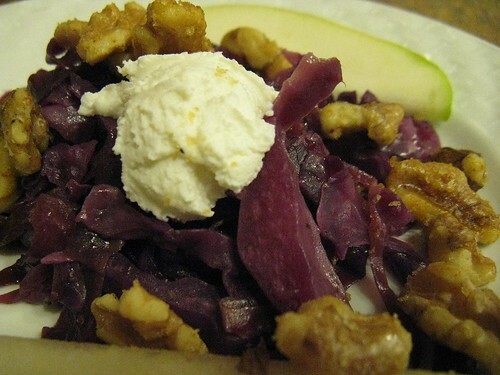 The first dish was a warm red cabbage salad. Don brought a vat of it already made, then demonstrated as well. It was both sweet and spicy, with a bit of cayenne, and served with spiced walnuts, sliced pears and a small lump of locally produced Gothberg Farms goat cheese. I adore braised cabbage, so I really went for this plate. 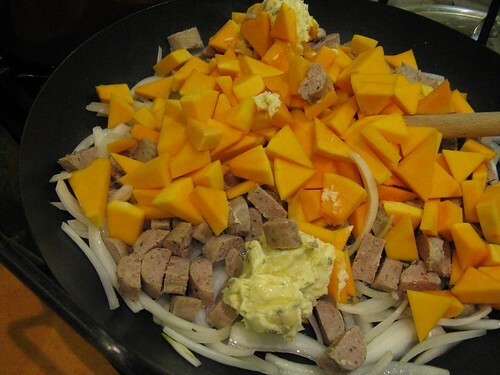 The entree was a fall-themed pasta: penne tossed with a mixture of butternut squash, apples, butter, sage and chopped-up pheasant sausage (imported from Utah). It was delish. 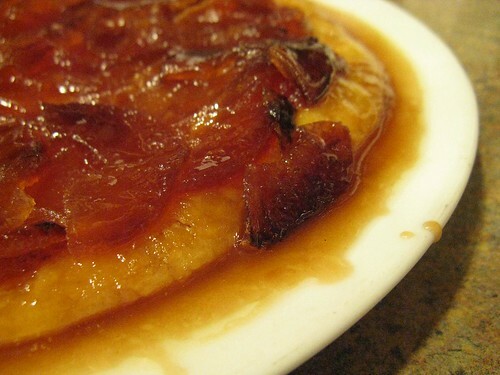 To finish us all off, Don made tarte tatin. He brought three already made, then demonstrated one. 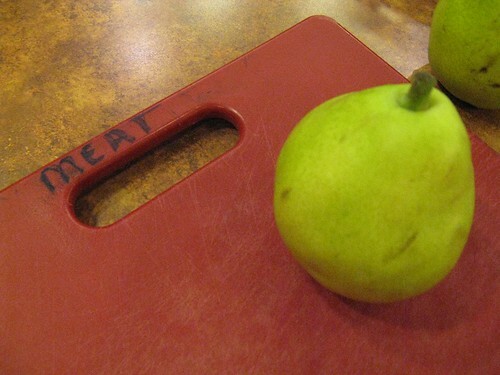 The fresh one was harder to cut, since it was still warm, but oh was it good. 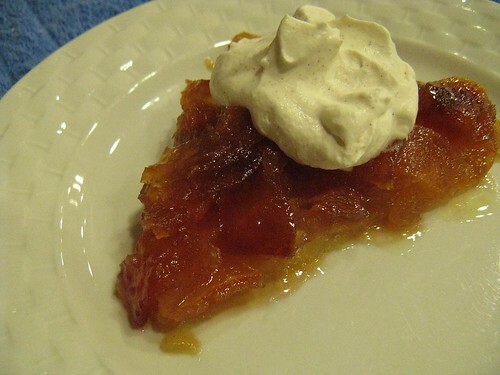 The slices, already redolent of butter and sugar, were served with a dollop of cinnamon whipped cream. Some people may have had trouble recovering from that dessert, but it sure was worth it.